Put into serivce painted in the red an white DY-scheme, without any form for titles the first two weeks, then op as a standards White-tail. 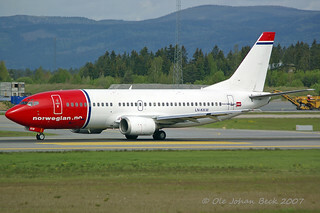 10-2007 LN-KKW showed up with the "Den mest fleksible måten å reise på" / (The most flexible way to travel), as LN-KKT, but -KKW had a white tail background while -KKT was red. 04-2014 LN-KKW painted in all-white, only wearing the "norwegian.no" decal.